Gulf War Illness (GWI)--the chronic health condition that affects about one in four military veterans of the 1991 Gulf War--appears to be the result of several factors, which differed in importance depending upon the locations where veterans served during the war, according to a Baylor University study. Published online today in the journal Environmental Health Perspectives the study investigated links between GWI and veterans' locations during the war. GWI was most prevalent in veterans who served in forward areas of Iraq and Kuwait, where it was most strongly associated with use of a medication given to 1991 Gulf War troops to protect them from effects of nerve agents. For personnel who remained in support locations, GWI was significantly associated only with pesticide use during the war. "Understanding the causes of GWI has presented a complex puzzle in the 20 years since the Gulf War," said Lea Steele, Ph.D., Baylor University epidemiologist and lead author of the study. "Many of the nearly 700,000 U.S. veterans who served in that war encountered different levels and combinations of potentially hazardous substances. Our study determined that wartime exposures and rates of GWI were not the same for all veterans in all areas. In earlier studies, the causes of GWI often seemed indecipherable, when such differences were not taken into account." The study found that GWI prevalence was nearly six times higher in veterans who served in Iraq or Kuwait, where all ground battles took place during the 1991 conflict, compared to veterans who remained on board ship during the war. For troops in the high-risk areas, GWI prevalence was 3.5 times greater in the subgroup that used pyridostigmine bromide pills, or PB, compared to those who did not use PB, which was issued by the military as a protective measure in the event of a nerve gas attack. GWI was also increased for forward-deployed personnel who reported being near exploded SCUD missiles or smoke from the Kuwaiti oil fires, and pesticide use. In contrast, for veterans who remained in support areas, GWI was significantly increased only in the relatively small subgroup that wore pesticide-treated uniforms and also used skin pesticides. The study found no significant link between GWI and warzone experiences associated with a high degree of psychological stress, such as serving in combat and seeing others who were killed or badly injured. The study evaluated symptoms, health conditions and deployment experiences reported by 304 veterans who served in the 1991 Gulf War, also known as Operation Desert Storm. That conflict concluded in February, 1991, after a six-week air campaign and four-day ground war. 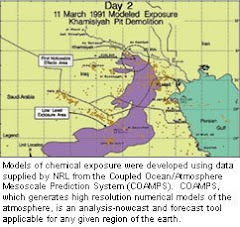 Although the war was brief, concerns have been raised about a variety of chemical exposures associated with Gulf War deployment. The Baylor study found that a large proportion of veterans who were in Iraq and Kuwait used PB pills and were exposed to the smoke from over 600 burning oil well fires, which darkened Kuwaiti skies for much of 1991. Investigations sponsored by the U.S. Department of Defense also indicate that approximately 100,000 U.S. troops were potentially exposed to low levels of chemical nerve agents released during weapons demolition operations in Iraq after the 1991 cease fire, and that thousands of troops were likely overexposed to different types of pesticides, which were commonly misused and overused during the 1991 Gulf War. "Our study results strongly suggest that GWI is the residual effect of exposures encountered by military personnel who served in the 1991 Gulf War," said Steele, research professor of biomedical studies in the Institute of Biomedical Studies at Baylor. "Although the specific biological mechanisms are not well understood, we know that a number of the 1991 Gulf War exposures of concern--PB pills, many of the pesticides, and low-level nerve agents--affect the same nerve signaling chemical, acetylcholine, which is involved in diverse processes necessary for normal brain and neurological function." 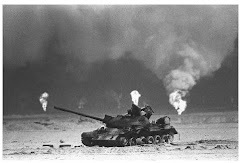 Gulf War Illness is the term commonly used for the complex of symptoms that affect Gulf War veterans at excess rates and are not explained by established diagnoses or routine laboratory tests. Symptoms of GWI typically include some combination of chronic headache, widespread pain, memory and concentration difficulties, unexplained fatigue, and digestive and other abnormalities. Studies indicate that GWI affects at least 25 percent of veterans who served in the 1991 Gulf War, and that few have recovered over time. "Twenty years after Desert Storm, it is essential to understand why veterans became ill," Steele said, "to better address the biological mechanisms that underlie veterans' symptoms and to prevent this problem from happening in the future." Study co-authors include Antonio Sastre, Ph.D., and Mary R. Cook, Ph.D., formerly of Midwest Research Institute in Kansas City, MO, and Mary M. Gerkovich, Ph.D., of the Department of Biomedical and Health Informatics, at the University of Missouri-Kansas City School of Medicine. This study is funded by the U.S. Department of Defense, Congressionally Directed Medical Research Program (http://cdmrp.army.mil). Editor's Note: The U.S. Senate recommended last week to eliminate funding for the CDMRP program for Gulf War Illness research. Baylor University is a private Christian university and a nationally ranked research institution. The university provides a vibrant campus community for approximately 15,000 students by blending interdisciplinary research with an international reputation for educational excellence and a faculty commitment to teaching and scholarship. Chartered in 1845 by the Republic of Texas through the efforts of Baptist pioneers, Baylor is the oldest continually operating university in Texas. Located in Waco, Baylor welcomes students from all 50 states and more than 80 countries to study a broad range of degrees among its 11 nationally recognized academic divisions.